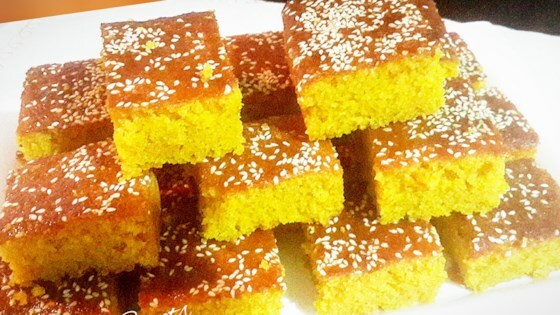 "A Lebanese dessert that is not overly sweet. It is pleasing to the American palate due to it's lack of rose water and orange blossom essence, found in most Middle Eastern desserts. Sahteyn! (bon appetit!)" Preheat oven to 350 degrees F (175 degrees C). Grease a 9 inch round baking pan. In a small bowl, mix semolina, flour, turmeric and baking powder. Set aside. In a large bowl, stir milk and sugar until sugar is dissolved. Add flour mixture and oil and beat with an electric beater at medium speed for 5 minutes. This step is essential, do not use any shortcuts. Pour into a prepared 9 inch round pan. Sprinkle top with pine nuts. Bake at 350 degrees F (175 degrees C) for 25 to 35 minutes, or until wooden pick inserted in center comes out dry. This classic cake is a stunner for the holidays, or any time. My whole family really enjoyed this recipe!! Its very yummy!! The younger ones put syrup on top to make it even sweeter. It has a very pungent taste that wasn't very pleasing. I assume it is an acquired taste, but my family and I disliked it. I added a good amount or rose water, and I cooked it longer in a gas oven. I made this cake using Chinese five spice instead of turmeric, and it was great. I really liked the texture. Without the spice, it's also a great eggless cake recipe. Yum! Easy to make, not too sweet, and great crumbly texture. Thanks!